Joyce Henion left Rockland County in 1998 to move her elderly parents and daughter into a home in Walker Valley, NY. A barn on the property and livestock on a neighboring farm revived her interest in animal husbandry, and her love of goats in particular. Seventeen years later, in this, the year of the Goat, Joyce participates in the Nyack Indoor Farmers’ Market at the Nyack Center as Acorn Hill Farmstead Cheese. This week, Joyce describes her journey from health care worker to goat herder, the advantages of cheese, milk and yogurt derived from her goats and introduces us to some of her “girls”named Lakshmi, Lightning, and Willow. What were you doing before you were goat herding? I have worn many hats in my life. 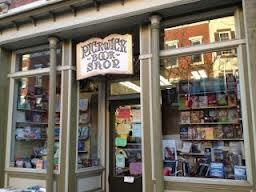 I grew up in Orangeburg and lived in Rockland until 1998. I have worked as an editorial and freelance photographer and have worked extensively in medical offices in Rockland County along with a period working at Nyack Hospital in the pathology department. I have always been drawn to plants and animals and during the late 1980s and early 1990s I began studying herbal medicine in the Catskills with an herbalist who had a herd of goats. I fell in love with the animals and knew one day I would have my own and be able to provide organic fresh dairy to my family and friends. Immediately prior to goat farming, I was spending my time taking care of a very young daughter and my elderly parents. We had moved to our current property because we needed to combine my parents home and our own to better manage my mother’s needs as an elderly MS patient. She never wanted to be a nursing home resident and I respected that wish very deeply. It was wonderful when I started working with my own goats and was able to bring newborn kids to my mother’s bed and share that with her. Are dairy products from goats healthier than products from cows? has more medium chain triglycerides that can speed up metabolism and may help lower cholesterol levels. Also, goat milk is lower in lactose which can be an issue for some people. It’s the alpha S1 casein protein, found in cow milk, that’s the problem. Both goat milk and human milk lack this protein. When goat milk is cultured for cheesemaking or yogurt, the cultures consume the lactose that is in the milk. How many goats are on the farm? don’t get milk without babies! Our base herd number is about 40 animals, give or take to give you a short answer. What are some of their names? I love that you asked this question! Our girls know their names and come when called. They are smart and curious creatures. We have many Goddess named girls, Isis, Pandora, Lakshmi, and natural phenomenon or spirits like Lightning, Devi, Willow… And food… Cocoa, Cappuccino, Vanilla Sprinkles. What are some of the challenges of goat farming? Farming in general is challenging. Most folks don’t realize what it takes to produce the food that is available in abundance in our culture. Making a living as a farmer is a huge challenge in terms of time and energy. I manage my herd organically. It is a challenge to find the time to spend seeing my goats so that I know they are healthy. On the other end of the spectrum, it takes a great deal of effort and logistics to attend the farmer’s markets. But I love to be there to talk with customers about the animals and how they use the products. You said you always loved goats? What do you love about goats? They are curious and affectionate, and they give us so much good nourishment… and they are dang cute on top of all that. They have been my go to place for peace and renewal while I was dealing with the harder parts of life and I expect that will stand true into the future. How do you manage over the winter? Is it rough on the goats? Winters are tough. Goats are native to dry climates and some years we are just living in a cold and soggy place. We do everything we can to keep our girls happy and during the winter. That means bringing them every bite they eat in the form of locally grown weedy untreated hay and organic grain in small doses. Sometimes, I think winter is harder on the humans because we have to be out seeing that they have and what they need no matter what. We often have baby goats born in the dark of a very cold night. I am there for every single birth. I have a great assortment of winter layers. What are your plans for the farm? I hope to continue bringing fresh, sustainable goat dairy products to regional communities that feel that knowing where their food comes from matters. There are some personal issues that may cause a reevaluation of where Acorn Hill Farm lives, but with a dozen years of production, I believe we can adapt to whatever the future holds. Popular products shift over the years, but right now I would say that our probiotic yogurt has become quite popular along with our whole goat milk ricotta which is unique in that it is a goat milk ricotta. My personal favorite and a favorite of many long time customers is our greek style feta. Raw milk hard cheeses are in high demand and are something that has personal significance, but the aging process and the space required limits our ability to focus more on raw milk cheese production now. I see that you do sell chevon. Under what circumstance is chevon available? Some years, I do sell chevon as a byproduct of the dairy. We raise some of our bucklings for meat and then bring those cuts to market. Unfortunately, the infrastructure for small farms producing meat in the mid-Hudson valley region needs to be addressed on a larger scale. There are too few facilities available to small livestock farmers. The costs associated with processing meat for sale are very high, so we limit what we do in terms of meat. Often the customer is not aware about what it takes to bring meat to market. Why do you prefer the term chevon to mutton? Actually goat meat doesn’t have a polite term in American culture. Chevon is the French term. Cabrito the hispanic…. 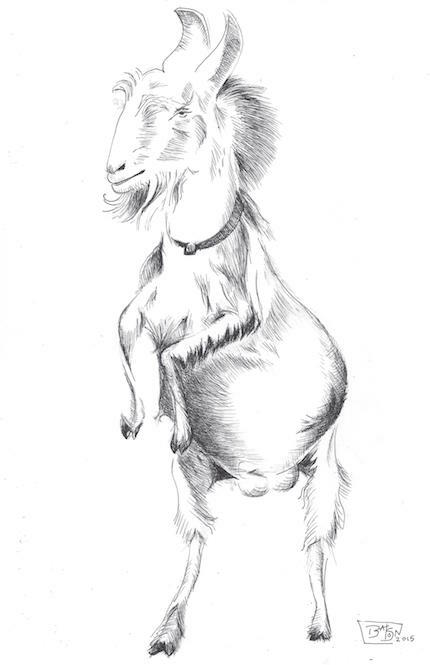 Capretto, Italian….. but no American term… just goat. Mutton refers to adult sheep while lamb is young sheep for meat production. Culturally, we are a bit behind the times here as goat is consumed throughout the world as a lean red meat. What are the items that you offer at the Nyack Farmers’ Market? I bring our full line of products to the Nyack market including yogurt, ricotta, greek style feta and our marinated feta. Several varieties of chevre, along with a more spreadable savory fromage blanc and for the sweet tooth goat milk fudge. We had a milk shortage this past season, but we should also have goat milk soap in the future and we hope to introduce a goat milk kefir. How many farmers’ markets do you attend? The number of markets I attend fluctuates from year to year with a high point being six and a more manageable being four. As I get older, I find that I need to find markets where the farm and the customer are a good fit; where our commitment to sustainable and healthy food production is appreciated. Has Community-Supported Agriculture (CSA) helped your farm? Working cooperatively with CSA that has a broad spectrum of products available has been a great fit for the farm. Rondout Valley Organics and Winter Sun Farms are two programs that we very enthusiastically participate with. I would love to find a template for a more specific CSA, offering our own products directly to customers who feel strongly about supporting local dairy. Why is it important for goats to be able to roam? Goats are curious creatures who thrive in interesting environments so they love to explore the paddocks on the farm throughout the seasons. They are also browsers rather than grazers and appreciate our woodsy place, taking advantage of the wild roses in early summer, going crazy for the goldenrod in late summer and reaching for the beech leaves and saplings in between. Does your daughter enjoy life on a farm? Aleah has grown up with the goats and we call her our “goat whisperer.” She can get any goat to do what is needed when everyone else fails. She has been chief midwife some years and lives and breathes the farm as only someone who has grown up with these beautiful animals can. Will she be following in her mother’s footsteps? That’s a funny question. A few years ago the answer would have been yes. More recently, she’s wanted to be a locavore chef. Now she’s focused on art, but that may well bring her full circle back. She’s always more than willing to help out. You can meet Joyce and sample the products of Acorn Hill Farm every Thursday from 8a-2p at the Indoor Farmers’ Market at the Nyack Center at the corner of Depew Avenue and South Broadway. The subject of my sketch is Neo, their gentle senior herdsire, who loves to dance. The title “A Goat Herding tale,” is an homage to “Oxherding Tale,”an incredible book written by Charles Johnson about the American south during slavery. Bill Batson is an activist, artist and writer who lives in Nyack, NY. “Nyack Sketch Log: A Goat Herding Tale” © 2015 Bill Batson. 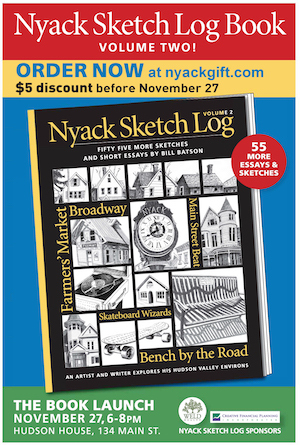 In Dec. 2014, Batson published “Nyack Sketch Log, An Artist and Writer Explores The History of A Hudson River Village.” Copies of the book can be purchased at billbatsonarts.com.